Little bits of encouragement as we grow together. I’ve been doing some deep work here on the blog. For one thing, I’m completely overhauling the website, and I hope to have the new site ready to launch in the next month or two. For another thing, I’ve been reading and praying and researching so that I can best serve you, my reader. 2. You are a momma of little people. 3. You want to make a difference as you pour the love of Jesus into the lives of your little people. There are exceptions to this (Hi, Daddy), but in general, how am I doing so far? The plan going forward, is to write with these perceptions in mind. I don’t want to waste your time by randomly sticking up posts. Instead, I want to be your cheerleader and encourage you as you pursue the heart of your heavenly Father. I haven’t finished the deep work yet, but I’d love to carry on a conversation in the process. So, how about we start with fasting? Every January and August my church (along with many others) does a season of 21 days of prayer and fasting. It is a time of early rising to intentionally spend time in worship, Bible study, and prayer; giving God the first of our day in an act of submission to Him. Fasting is the practice of abstaining from something in an effort to connect with God. He doesn’t like us more if we do it, we are not a superior Christian if we do it, but it does honor Him by removing distractions as we focus our heart and attention toward Him. The question is, how do we effectively fast with little people around? I don’t know about you, but my little people do not always follow my pre-determined schedule. They tend to wake up mid-way through the 6am livestream, and since their bodies are still growing, l cannot ask them to fast from food. These small ones are the definition of hangry. Some of you may be pregnant, or nursing, or have health needs that require you to eat. Some of you aren’t sleeping very much at the moment because the baby is still waking up three or more times every night. This makes it hard (impossible?) to wake up early enough to have an entire hour of quiet with the Lord. Here is what I want you to hear today: God sees your heart and He loves your efforts. Our season of fasting may look a little different during these younger years, but that does not make them wasted. Consider implementing one of the following ideas for 21 days. Will any of these work for your current stage of life? -Starting the day with worship music. -Staying off of social media. -Keeping the tv off after the kiddos have gone to bed. -Choosing one verse to meditate on during the course of the day. Or week. Or 21 days. -Fasting from one type of food item. What is it that you reach for when you just need a moment? Instead of reaching for it, pray to Jesus. -Fasting one meal during the day. -Consuming a liquid diet for one day. No matter what you do, it’s the heart behind it that matters. God loves for His people to seek after Him. He knows your current reality and sees the sacrifices that you make to spend time with Him. He delights in you. Keep after it. Any time you find to devote toward God will not be wasted. We are wrapping up the final days of 21 days of prayer and fasting at my church. As my last post stated, I started out a bit rocky. However, in the past two weeks I feel like I am experiencing significant changes. My main objective was to get up each morning at 6 so I could dedicate the first part of my day to the Lord. Did I do this perfectly? No. Was it worth the effort? Absolutely. – Setting an alarm is a necessity. If you are awake at 5, this does not mean you will be awake at 6. Also, check the alarm setting on your phone to make sure it has a ringer. If not, you will wake up at 6:30 with a very silent “Alarm” message flashing on your phone. – The enemy will use every tactic possible to keep you from your appointment with God. Things like, children waking up uncharacteristically throughout the night, illnesses, and extra little ones in your bed. This is a sign that God wants to do something BIG in your life. Don’t let the enemy steal this time from you! – Find something that helps you focus. I personally find it difficult to pray for an hour straight. It has helped me to turn on my worship music, write out my prayers, or even to pray while coloring. Taking a shower right away and turning on bright lights is a great way to help your body wake up so you don’t fall back asleep while praying! – By far, the most beneficial thing I have done during these morning prayer times is write out my prayers. I’ve had journals in the past, but this time I typed out my prayers and what I was learning on the computer. I type rather quickly, so I was less likely to lose my train of thought. I also love having the ability to look back on the things that I have prayed and see how God has answered my prayers. One morning in particular, I was praying about fear and took the opportunity to search for and write out verses on how we do not have to be afraid. This was a powerful way to start my day! As a side note, I have been blown away by the love and encouragement I have received from friends during these 21 days. I have received texts, cards, and offers to watch my children so I could go to prayer at church. I also had several people come up to me and encourage me in some way at one of the special Wednesday night services. It has been so heartwarming to have been on the receiving end of such encouragement. This makes me want to do the same for others! Our words have such a powerful impact on those around us. Let our impact be a positive one! Final takeaway? It’s all worth it. I am going to continue to dedicate my mornings to the Lord. There is no better way to begin my day. Every August and January, my church holds a 21 day period of fasting. The main goal is to shift our focus from what we think we need, so that we ultimately become dependent on our relationship with Christ. Each time, when deciding what to fast, I ask myself,”What is something I am dependent upon? What is something that would allow me more time in prayer if I gave it up?” I then try to nail down some specific things I am praying for during that season. I usually do a limited food fast and give up some or all forms of media. It’s amazing how giving up something so small can help quiet my thoughts and bring me closer to the Spirit. After doing this for several years, I’ve learned that I often get what I put into this season of fasting. I’ve even developed healthier habits. That being said, this time around I felt led to do something a little different. I decided I would fast sleep. Okay, not all sleep. That’s ridiculous. But let’s be real – sleep can be a huge idol for me. I talk about it a LOT. I love sleep and allow who I am to be dictated by how many hours I have procured. 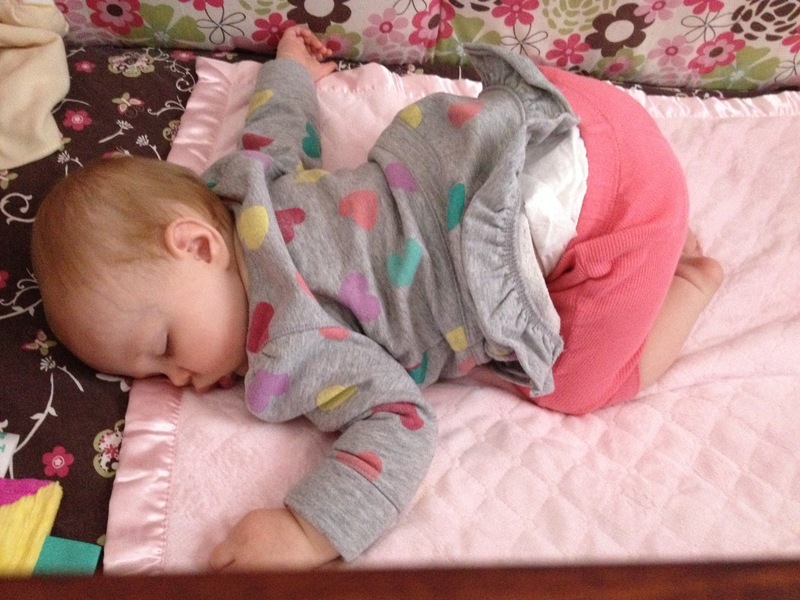 At 15 months old, the baby has FINALLY started consistently sleeping through the night. It’s amazing! But the thing is, I still find it hard to get up before my girls wake up. So, my main goal during this period of fasting is to get up every morning at 6 to read my Bible, pray, listen, worship, and ultimately devote my day to Him. Our lead pastor has been using the phrase, “Before I start my day, God has something to say!” This is such a true statement. I’ve been seeking God for a long time, and I’m much more refreshed and ready to tackle all that life throws at me when I give God the first moments of my day. We are almost a week in, and it has been hard. HARD. I’ve kinda failed. I’m a pastor’s wife and I’ve FAILED. Why am I telling you this? Through this failure, I am encouraged. If Satan is working so diligently to keep me away from this chunk of time with God, there must be something extra special I will find in it. I am more determined and cannot wait to see all that God has to say to me. We have a little over two weeks left in the fast. If you happen to see me around, could you do me a favor? Please ask me how this waking up at 6 thing is going, because who I am does not depend on sleep. Who I am depends on Christ in me. My name is Amanda. I’m a pastor’s wife and stay-at-home mom with a desire to honor God with my life. I’ve got a lot of learning to do and hope you gain a little something while I share my heart with you!